Now a division of KV NATURALS, INC., we've got so many wonderfully verified high quality kava-related products, they barely fit on our catalog page below. We've also got an ultra-secure shopping cart page, complete with extended descriptions and CLICKABLE PHOTOS. Our strongest Powdered Kava Root has matured for over four years, is a noble variety of Kava (as seen in the simple Colormetric Test by Vince Lebot) has a tested kavalactone content of about 12%, and is offers a less bitter taste and most pleasurable effects. * We are proud to boast more returning customers than any other kava farm we know of; a testament to the purity and strength of our 'Awa (Kava). Our Kava Kava root is the pride of our family farm, and we offer our 100% Satisfaction Guarantee to any customer who doesn't think our kava is the best they've ever tried. Directions: 1 tablespoons 3 times per day. Do not exceed 2 tablespoons per serving. Daily dosage not to exceed 6 tablespoons. Maximum period of daily use: 3 months. Use may resume for 3 months after a 2-week break. Directions: 1 tablespoon 3 times per day. Do not exceed 1 tablespoon per serving. Daily dosage not to exceed 3 tablespoons. Maximum period of daily use: 3 months. Use may resume for 3 months after a 2-week break. This Rough Cut Hawaiian Kava is simply a less powdered version of our Noble Powdered Kava Root. When we grind our freshly-cut Kava root, we leave about 20% of the root as "rough cut", which makes powdering the root the rest of the way super simple for you. Any coffee grinder will handle these small, capsule-sized pieces. Just like the coffee connoisseur who knows the difference between a cup of coffee made from freshly-ground beans rather than pre-ground coffee beans, the kava connoisseur will know the difference between a shell of Kava made from freshly-ground rough cut Kava pieces. The Serving Size is based on the assumption that the end user (you) may be grinding these in a small coffee grinder. Making any kava drinks from the raw, rough cut Kava without grinding will result in slighter weaker, but much smoother drink. - Spice flavor contains Kava (Piper methysticum) root extract (4:1). Below panel, list "Other ingredients:" Soy powder, cane sugar, chai powder, and proprietary spice extract blend. - Banana/Vanilla flavor contains Kava (Piper methysticum) root extract (4:1). Other ingredients: Banana powder extract, vanilla bean powder extract, and pineapple powder extract. - Cocoa flavor contains Kava (Piper methysticum) root extract (4:1). Below panel, list "Other ingredients:"Soy powder, cane sugar, ginger powder, anise seed powder, nutmeg powder, and proprietary cinnamon chai blend. For a portable dietary supplement that naturally promotes relaxation and helps ease the mind from daily stress. * These revolutionary (really) Instant Kava Singles are unlike anything else in the marketplace! Over a year in development, we've finally come up with an extract that not only easily dissolves in water, but is so concentrated, only a small single packet is required. 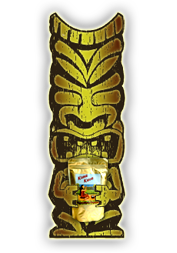 Available in our usual 3 flavors; Organic Banana/Vanilla, Organic Chocolate, and Organic Tropical, these on-the-go packets are great for an instant Kava experience anywhere. Put them in lunches, keep them in a backpack, or simply have them waiting when you get home from work, for the easiest, but strongest Kava experience available, with the least amount of mess. Suggested Serving: 1 packet, 1 time daily. Daily dosage not to exceed 1 packet for a single serving of 280mg of Kavalactone. Maximum period of daily use: 3 months. Use may resume for 3 months after a 2-week break. Instructions: For each serving, simply place entire packet into 1/4 cup (60mL) of water, stir thoroughly, and enjoy. A blender or shaker bottle makes blending easier, but it's really not necessary! - Tropical flavor contains Kava (Piper methysticum) root extract, maltodextrin, corn starch, Stevia, and a proprietary organic tropical extract blend. - Banana/Vanilla flavor contains Kava (Piper methysticum) root extract, maltodextrin, corn starch, Stevia, and a proprietary organic Banana/Vanilla extract blend. - Cocoa flavor contains Kava (Piper methysticum) root extract, maltodextrin, corn starch, Stevia, and a proprietary organic chocolate extract blend. * These statements have not been evaluated by the Food and Drug Administration. This product is not intended to cure, treat, diagnose or prevent any disease. Yes, if you don't strain, your Kava will be slightly chalky, but with such a smooth flavor, and with such a concentrated serving of Kavalactones, this is one of our favorite new products at Kona Kava Farm, simply because of the intoxicating aroma, but it's a Kava Dietary Supplement with a slightly bigger "kick" than your average Powdered Kava drinks made from regular powdered root. Naturally promotes relaxation and helps ease the mind from daily stress. * We use only organic, blended Kava Kava roots from the uniquely potent 4-2-6 'Awa (Kava) plants. Kona Kava Farm takes great pride in every herbal supplement we offer. Hand-crafted in small batches. Infused with pure passion. Directions: 2 or 3 capsules, 4 times per day. Daily dosage not to exceed 12 capsules per day. Maximum period of daily use: 3 months. Use may resume for 3 months after a 2-week break. One of our most popular products, these capsules may naturally promote relaxation and help ease the mind from daily stress. * We use only organic, blended Kava Kava roots from the uniquely potent 4-2-6 'Awa (Kava) plants. Kona Kava Farm takes great pride in every herbal supplement we offer. Hand-crafted in small batches. Infused with pure passion. These capsules contain a proprietary spray-dried blend of liquid extracts including pure kavalactone 30%, Hops, Damiana, Valerian, and Calamus. Take no more than 2 capsules at a time, 2-3 times per day. These are already Top Sellers. Directions: Take 2 capsules to 3 times per day. Do not exceed 6 capsules per day. Maximum period of daily use: 3 months. Use may resume for 3 months after a 2-week break.. Naturally promotes relaxation and helps ease the body and mind from daily stress. * This kava paste is one of our all-times favorites! For an ultra-pure extract, this paste is made with supercritical CO2 cold extraction technology using only the roots of kava. Please note that is an 55% concentration of Kavalactones only, and has a coveted 2-4-6 lineup for the "happiest" kava you may ever experience. This has always been one of our Top Sellers here at Kona Kava Farm, and with the new extraction process and the latest harvest, we know you'll be back for more. NEW STRONGER FORMULATION! This latest paste is one of NEWEST favorites and is more potent than our Top Selling Kavalactone 55% Paste! Naturally promotes relaxation and helps ease the mind from daily stress. * This is our latest kava kava paste product and one of our newest favorites! Using supercritical C02 cold extraction technology, the paste is not only made exclusively from the roots, but crafted as a FULL SPECTRUM 55% extract, rather than an extract consisting of isolated kavalactones. NEW PRODUCT! Naturally promotes relaxation and helps ease the body and mind from daily stress. * This all-new 33% Kava Powder is a new favorite here. For an ultra-pure extract, this silky powder is made with super-critical CO2 cold extraction technology using only the roots of kava. Please note that is a 33% concentration of a 2-4-6 Kavalactone lineup. The high concentration means you only need to take 1/4 teaspoon per serving. Ingredients: Liquid extract of Kava root. Other products: Grain alcohol, glycerin, purified water. This organic full spectrum extract is crafted from the highest quality farmed or sustainably harvested Kava in pure grain alcohol. Hand-crafted in small batches. Infused with pure passion. Directions: The Kava Tincture has a confirmed 3% Total Kavalactone Content, with a Kavalactone lineup of 2-4-6. The Kava Tincture Plus has a confirmed 6% total Kavalactone, with the same super happy 2-4-6 Kavalactone lineup. Take 2 dropperfuls up to twice daily for a total dose of 290mg Kavalactone. Our newest and hottest seller is our Kava Tincture MAX, with a stunning 12% Kavalactone content. Not for beginners! We have assembled all the ingredients that make up a 2-person serving of our favorite kava kava recipe. This includes our best kava kava root, a palmful of lemongrass, 10 grams (1 tablespoon) of lecithin, a 5" x 8" Muslin straining bag, and complete instructions. Zen'd contains no alcohol, no caffeine, and no melatonin. Made with 87.5% cocoa beans, soy lecithin, dehydrated cane juice, and sweetened with stevia. Not only is this chocolate healthy and vegan, it's the best tasting chocolate we have ever eaten. It's formed just like chocolate chips, so they can be used in recipes or eaten right out of the bag. So delicious, we have them under lock and key! No content from this site can be reproduced without the expressed consent of Kona Kava Farm and KV Naturals, Inc.